Amazing Grace Wind Chime for Home Decor. -MELODIOUS AND DEEP TONES- This Wind Chime will delight your Senses with deep and soothing tones. -PREMIUM AND DURABLE QUALITY- 6 gold-colored aluminum tubes,solid wood top and wind catcher. Over all size 31 inches. -GREAT GIFT - it is a great Mother's Day,Birthday, or Christmas gift for your family member or friends. -HOME DÉCOR- Idea for the patio,garden,backyard or anywhere you wish to add beautiful melodies, wonderful sounds coming,like the sound of nature,the nature with the powder of wind to play music,how pleasant scenery. -100% MONEY REFUND GUARANTEE- Enjoy your brand new chime or your money back,we offer free new replacement or full refund if you are not fully satisfied with your wind chimes. Thanks for visiting BlessedLand store! 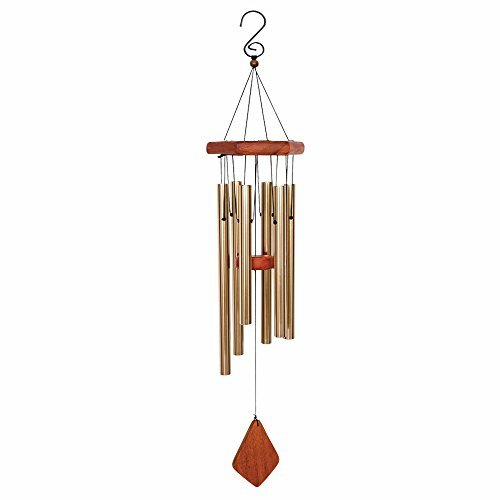 MELODIOUS AND DEEP TONES- This Wind Chime will delight your Senses with deep and soothing tones. PREMIUM AND DURABLE QUALITY- 6 gold-colored aluminum tubes,solid wood top and wind catcher. Over all size 31 inches. GREAT GIFT - it is a great Mother's Day,Birthday, or Christmas gift for your family member or friends. HOME DÉCOR- Idea for the patio,garden,backyard or anywhere you wish to add beautiful melodies, wonderful sounds coming,like the sound of nature,the nature with the powder of wind to play music,how pleasant scenery. 100% MONEY REFUND GUARANTEE- Enjoy your brand new chime or your money back,we offer free new replacement or full refund if you are not fully satisfied with your wind chimes. If you have any questions about this product by BLESSEDLAND, contact us by completing and submitting the form below. If you are looking for a specif part number, please include it with your message.